After being picked to come in seventh by the preseason polls, the NMU Wildcats are proving haters wrong. After sweeping #14 Bowling Green last weekend, the Cats have already tied their total wins from last year, and currently three points ahead of the Falcons in second place within the WCHA, but are a solid 8 points behind league leaders Minnesota State. They are led by three upperclassmen forwards, Try Loggins (11-14-25), Adam Rockwood (4-21-25) & Robbie Payne (17-6-23), and being backstopped by the Finnish goaltender Atte Tolvanen, who has posted a 11-5-1 record, with a 2.58 GAA and .907 save %. The Cats will be on their own ice, which being an Olympic sheet will give them a natural advantage over the Lakers. The Lakers & Wildcats played a home-and-home nonconference series earlier this season, with each team winning on their own ice. Currently the Lakers are behind the Cats with a -1 goal differential if the teams split the weekend, without the Lakers outscoring NMU on the weekend. That’s a steep mountain to climb considering what this team has done in the past few months. Last weekend being the exception. While the Lakers were shutout Friday night against Ferris State (4-0), the team, to my eyes, played with a bit of spark and teamwork – something we haven’t seen for most of the year. This proved helpful in Saturday nights 5-3 win, where the team won by committee: Each of LSSU’s 5 goals came from a different scorer, and the only player to net more than one assist was Diego Cuglietta. If the Lakers can use this past weekend as a launching pad for the next few weeks, they stand a chance at getting a place in the playoffs, but regardless of if they win or not, the decision is largely out of their hands. You can listen to the Voice of the Lakers Bill Crawford locally on 99.5 YesFM. If the audio stream is working, the game can also be heard online at www.yesfm.net, as well as watch the game on WCHA.tv. Puck drops at 7:00pm both nights. 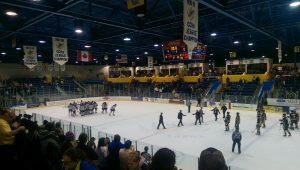 Quick History of the Great Lakes Invitational & Series Preview – Lake Superior State @ Great Lakes Invitational.